Yesterday I had the pleasure of touring Sheridan Elementary, a school on the southern edge of the city located in the Oceanview district — quite close to Aptos Middle School and Jose Ortega Elementary. Sheridan is one of our “outlier” schools because it outscores the “predictive power” of its demographics — over 70 percent free/reduced price lunch and 62 percent AA/L/S (African-American, Latino or Samoan) students. In 2009, Sheridan’s Academic Performance Index (API) was 833 — the state calls any school with an 800+ API a successful school. (Here is a detailed report of Sheridan’s results on the California Standards Test). The principal, Dina Edwards, and Neil Matsui, the President-elect of the PTA were on hand to greet me (I was accompanied by a friend of a friend, a prospective K parent who received Sheridan in the lottery and didn’t know anything about the school). We peeked into orderly classrooms of students quietly going about their work, and enjoyed looking at the student artwork posted everywhere. The facility is quite new (less than 20 years old), and has one of the most comfortable and acoustically-sound auditoriums that I’ve seen in any of our elementary schools. Sheridan’s auditorium, and Principal Dina Edwards with the PTA’s Neil Matsui. I was particularly impressed with the quality of the student writing that was posted around the school. Several weeks ago, Sheridan students visited the King Tut exhibit at the DeYoung, then wrote several paragraphs each about their visit. Reading over the paragraphs they produced, I was surprised to find that the students were second graders. Sadly, though Sheridan is not designated a hard-to-staff school, five teachers — representing about a third of the staff– nevertheless received pink slips (Mr. Matsui had a letter ready for me signed by the staff and PTA advocating for the Board to save teachers’ jobs). The parent who accompanied me on the tour seemed to be impressed by a number of things at the school, but still declined to register at Sheridan before the Round II deadline yesterday. I have a few other friends and acquaintances who were offered seats at Sheridan after going 0/7 in Round I, as far as I know, none of them have yet registered. And indeed, a look at the Round I statistics this year and previous years show that Sheridan generally receives just a handful of requests: 13 first choice requests (including four younger siblings) this year, and 45 total, for 44 seats. Honestly, I have a hard time understanding that after visiting this jewel of a school. The only criticism I have ever heard of Sheridan is its neighborhood, but during the day it seemed safe and mostly residential, if not particularly affluent. There is a lovely little park on the corner with a new recreation center and playground. I checked the Police Department’s CrimeMAPS statistics, and there does appear to be drug activity in the neighborhood (seven drug/narcotics incidents out of 37 total reported for the area in the 90 days ending yesterday). However, I’m pretty much willing to bet that most of those occurred at night. Anyway, I did find at least one very high-demand elementary school with worse crime statistics–more than twice as many incidents!–over the same period and surrounding radius (and I’m not saying which one, in order to avoid freaking out the school community). In other words, the neighborhood shouldn’t be that high a barrier to get over. 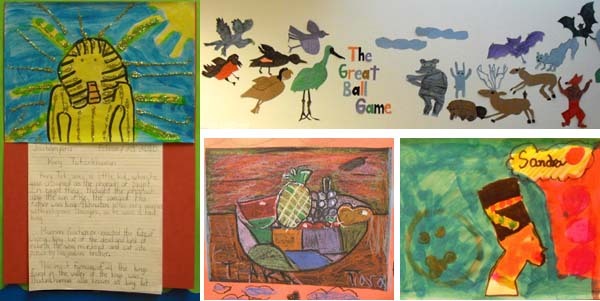 More Sheridan student work, including projects about the trip to see King Tut, and illustrations the second grade students made for a story they wrote about a ball game between birds and animals. This entry was posted in Improving schools, issues and tagged school sites, Sheridan, student assignment. Bookmark the permalink. I agree with you about the school and the neighborhood. My son spent a summer going to an Excel camp at Sheridan and so we commuted there daily from the Miraloma area. Very easy and quick to get to, good facilities, easy parking. Families from that area walked to school and were very nice. The biggest barrier to most parents seems to be the neighborhood and the perception that it is dangerous. Maybe the city, school and neighborhood can work out ways to improve the perception of the neighborhood – keeping it clean, working on getting loiterers moving along and developing some community events that connect the school with parents in a positive way. Sheridan has a lot going for it, and its a shame that it hasn’t attracted enough parents that are willing to help it change its image, similar to the parents who turned around so many other schools – Miraloma, McKinley, Grattan, etc. Parents who register for this school would have a lot to work with. Thank you for taking the time to visit Sheridan. I also appreciate your conveying the letter of our concerns to the rest of the Board. I’m glad to read that you view the school in much the same way that I did after my first tour last year. My opinion of the school has increased since then, especially after I got to know the teachers and see them in action.